Vancouver, BC – Sabina Gold & Silver Corp (SBB.T), (“Sabina” or the “Company”) is pleased to announce final assay results from the summer exploration diamond drilling program (Figure1) at its 100% owned Back River Gold Project in Nunavut Canada. Drilling intercepts have highlighted the importance of a mineralized Deep Iron Formation (“DIF”) horizon approximately 40 to 100m stratigraphically below the main lower iron formation at the Llama and Umwelt deposits. Initial assay results of up to 98.31 g/t Au over 1.13m from drill hole 17GSE521 and 23.20g/t Au over 2.05m including 48.65g/t Au over 0.95m from 17GSE528 have been returned. Other significant drill results are included in the table below. The DIF horizon is a new stratigraphic target over a distance of greater than 3km at Back River within the Llama and Umwelt deposit trends and is believed to be relatively continuous and favorably folded within the Goose project area. This new horizon is analogous to the DIF and lower sediments at the Goose Main deposit, which hosts approximately 20% of the existing Goose Main resource. North of the Umwelt deposit, five drill holes tested the east fold limb of the Umwelt DIF over a 250m strike length at a shallow depth level from 66 to 230m. Drill hole 17GSE521 intersected 98.31g/t Au over 1.13m from 207.0-208.13m and 3.88 g/t Au over 2.61m from 221.84-224.45m. The central fold limbs of the Umwelt DIF was targeted immediately below the Umwelt deposit open pit resources, with two drill holes (17GSE526 and 17GSE528), at an intermediate depth level of 290m-450m (Figure 2). Drill hole 17GSE526 intersected 3.14g/t over 1.25m from 444.95-446.20m within eastern limb of the central antiform and a high grade zone running 23.20g/t Au over 2.05m including 48.65g/t Au over 0.95m from 470-472.05m within mineralized and veined lower sediments was intersected by drill hole 17GSE528. The east fold limb of the Umwelt DIF immediately below the Umwelt deposit Vault Zone was intersected by drill hole 17GSE525 from 940.2-975.1m. This zone had minor arsenopyrite and pyrrhotite mineralization but returned no significant gold values. True widths of the intervals are unknown at this time. Mineralization within the DIF zone is focused within a folded, interbedded sequence of silicate iron formation and turbidite sediments where the units are coincident with gold bearing structures. Arsenopyrite, pyrrhotite, and pyrite occur in variable concentrations within the DIF horizon where a portion of high grade mineralization is recognized to occur in association with localized quartz veining. Recognition of this broad new stratigraphic zone with structural elements common to other Goose Property deposits is a technical success. Concurrently developing the geological and mineralization framework, testing of the DIF target is considered preliminary therefore additional modelling and future exploration targeting will focus to best understand and evaluate for resource additions. 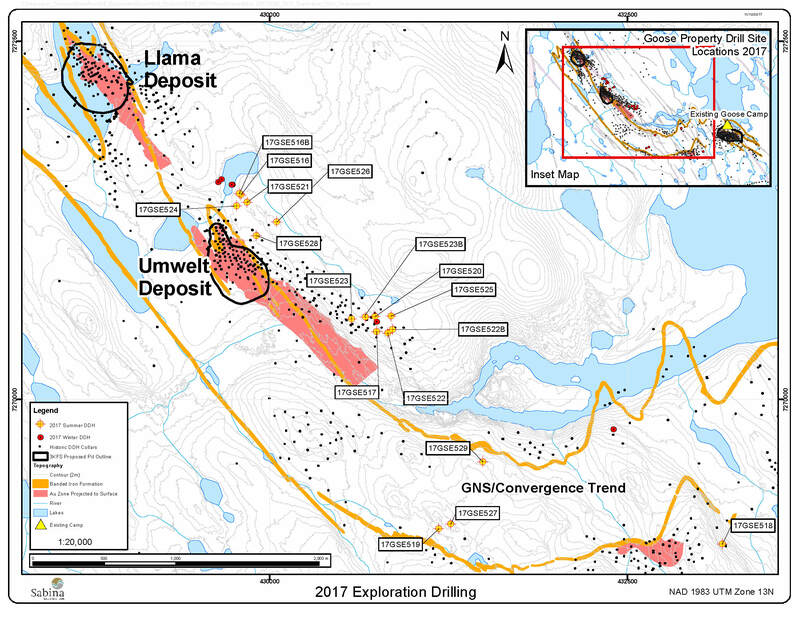 Sabina completed 9,869 meters of drilling in 17 drill holes during the summer program with significant success demonstrated at the Umwelt Vault and Llama extension targets (news releases Sept 5, 2017; Oct 19, 2017; Nov 2, 2017). Exploration efforts focused on the continued advancement of key mineralization settings that are analogous to current Back River resources. Testing of prominent gold trends at the Goose Property included drilling at the GNS and Kogoyok targets. At GNS, favourable structure and stratigraphy coincident with mineralization is interpreted to be a shallow limb expression linked to the larger Llama-Umwelt trend. Drill hole 17GSE529 was completed during the summer program, testing open plunge controls in an effort to establish orientation of the mineralizing structure. At Kogoyok two drill holes systematically and successfully tested a favourable intersection lineation of lower iron formation and a felsic intrusion within a controlled plunge orientation over a strike length of approximately 120m. The second drill hole, 17GSE527, returned no significant results. Exploration at the GNS and Kogoyok targets continues to advance and remains fundamental in the development of the geological framework that is a key tool in vectoring towards further resource potential at the Goose property. All additional results not previously released from the summer 2017 drill program are summarized in Table 2. Sabina will integrate the 2017 drill results and findings to further enhance the current geological model, and together with new geophysical surveys and renewed prospecting and mapping efforts Sabina will continue to pursue and focus on high impact greenfield and resource extension opportunities through 2018. This news release contains “forward-looking information” within the meaning of applicable securities laws (the “forward-looking statements”), including our belief as to the extent, results and timing of exploration programs exploration results, reserves estimates, potential production from and viability of the Company’s properties, production and operating costs and permitting submission, timing and receipt of necessary permits and project approvals for future operations and access to project funding. These forward-looking statements are made as of the date of this news release. Readers are cautioned not to place undue reliance on forward-looking statements, as there can be no assurance that the future circumstances, outcomes or results anticipated in or implied by such forward-looking statements will occur or that plans, intentions or expectations upon which the forward-looking statements are based will occur. While we have based these forward-looking statements on our expectations about future events as at the date that such statements were prepared, the statements are not a guarantee that such future events will occur and are subject to risks, uncertainties, assumptions and other factors which could cause events or outcomes to differ materially from those expressed or implied by such forward-looking statements. Such factors and assumptions include, among others, the effects of general economic conditions, commodity prices, changing foreign exchange rates and actions by government and regulatory authorities and misjudgments in the course of preparing forward-looking statements. In addition, there are known and unknown risk factors which could cause our actual results, performance or achievements to differ materially from any future results, performance or achievements expressed or implied by the forward-looking statements. Known risk factors include risks associated with exploration and project development; the need for additional financing; the calculation of mineral resources and reserves; operational risks associated with mining and mineral processing; fluctuations in metal prices; title matters; government regulation; obtaining and renewing necessary licences and permits; environmental liability and insurance; reliance on key personnel; the potential for conflicts of interest among certain of our officers or directors; the absence of dividends; currency fluctuations; labour disputes; competition; dilution; the volatility of the our common share price and volume; future sales of shares by existing shareholders; and other risks and uncertainties, including those relating to the Back River Project and general risks associated with the mineral exploration and development industry described in our Annual Information Form, financial statements and MD&A for the fiscal period ended December 31, 2016 filed with the Canadian Securities Administrators and available at www.sedar.com. Although we have attempted to identify important factors that could cause actual actions, events or results to differ materially from those described in forward-looking statements, there may be other factors that cause actions, events or results not to be as anticipated, estimated or intended. There can be no assurance that forward-looking statements will prove to be accurate, as actual results and future events could differ materially from those anticipated in such statements. Accordingly, readers should not place undue reliance on forward-looking statements. We are under no obligation to update or alter any forward-looking statements except as required under applicable securities laws. This news release has been authorized by the undersigned on behalf of Sabina Gold & Silver Corp. Figure 1: Plan map of the Goose Property. Drill holes from the summer 2017 season are labelled. 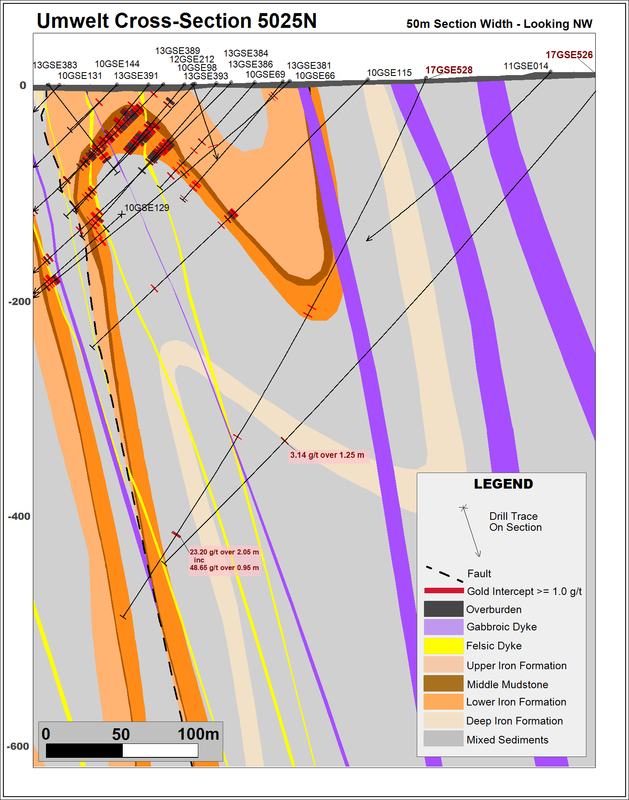 Figure 2: Cross section 5025N highlighting 17GSE526 and 17GSE528 drill holes intersecting the Deep Iron Formation.